Ordinarily, when I go to an estate sale, I dig deep to muster the fortitude to elbow my way through the close quarters and the crowds. I get in, get out, and try to put the experience behind me so I’ll willingly leave my house again. I go because my mom has this uncanny ability to glance at front page of the newspaper for 3 seconds and know what estate sale will have the good stuff like my ’40s blond mahogany dining room set, where when I try to find a good sale on my own, I end up sifting through musty stacks of racist literature and smelly stuffed animals. 4 years later, she will say, “remember the house with the Juliet balcony in the pink bedroom with two fireplaces on the corner of Holman and Schmolman?” I of course do not remember, just like I don’t remember yesterday’s sale because I was so focused on rushing outside with all possible haste so that nobody touches me, because I am well adjusted. There is usually an odd assortment of half-used toiletries in the bathrooms of estate sales, so they’re a good place to duck away from the crowd for a second. I don’t want to over-sell this, but this bathroom had the best wallpaper there has ever been. It was shiny, and gold, and shiny all over again. Maybe I was licking it, because the guy running the sale came in and told me, “There were extra rolls of it. But I threw them away.” Now I will take a minute to mourn. I collected a handful of of things to buy, because that is how I heal. I came away with a sparkly black necklace for $16, a stack of seven gold trays to hold things like sparkly black necklaces for $1, and a 75 cent yellow swan which I’m not sure about. And then I rushed out by the garage to recover, while my mom finished shopping. 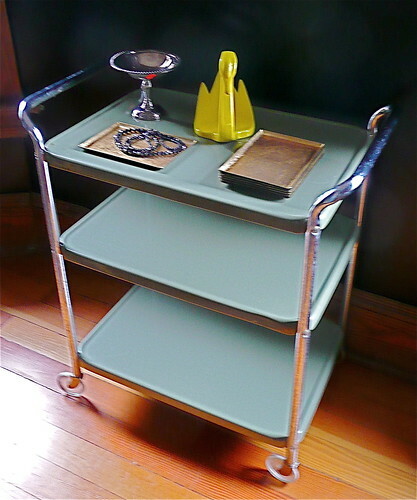 The guy working the sale in the garage saw me eyeing the bar cart sitting there. I was eyeing it, thinking about how much I have grown from back when I would have bought something like that, with good intentions of cleaning it up and maybe disassembling and repainting it, but then put it in the basement with all the others, until the cats ruined it and I had to pay to have the garbage haulers take it away. But I am weak. The guy spent some time telling me about how I might fix it up, and when that didn’t work, he offered it to me for $1, and when that didn’t work, he told me I already spent enough, and I should just take it for free, or he would give it to the scrap metal haulers at the end of the day. I am only human. So now I have this. It cleaned up pretty nice, but I have no place for it. I should not be allowed to leave the house. Ooooh, spicy wallpaper! Nice chandeliers, too — very Trump. You are hereby absolved for your errant bar carting. Maybe it’s the picture, but it looks like it really cleaned up nicely. Me like. I may have an uncanny ability to find good estate sale, but Megan has the uncanny ability to find amazing things at estate sales. Oh, I can find the big blinking stuff alright, like the Asian inspired blocky blond mahogany table, which looks incredible in her dining room. Or maybe a 1974 Cadillac with 35,000 original miles–which I always desperately want because it’s such a good deal. I’ll go home and pine for this car that I never once considered before. I don’t need it; it’s crazy really, but I’m so tempted. The only way my husband can distract me is by offering to open a bottle of champagne, which I understand on good authority, can be opened at any hour of the day without cause for alarm. I also “found” a mahogany breakfront, some twenty years ago, but I paid over $1,200 for it, and now that I want to move it along, I can’t even brag that it once belonged to Neil Goldschmidt’s grandmother, because that’s not exactly of big selling point these days. So anyway, Megan can reach into a pile of “I can’t believe they’re trying to sell this stuff,” and pull out an exquisite necklace for $2 that I wouldn’t have seen had it grown a tail rattle and bit me. Not to mention, she can be minding her own business outside far from the maddening crowd and people give her stuff. Meanwhile, I’m still inside trying to negotiate a $5 price break on necklace marked $66.50. Which I only found it because it was in a big lighted “stuff for suckers” display case. I’ll probably never wear it, but by dog, I wasn’t about to leave empty handed. P.S. You can always leave a bid on the car and still enjoy the champagne. The fixtures were so pink! A big square pink tub that would now be Jacuzzi I suppose. 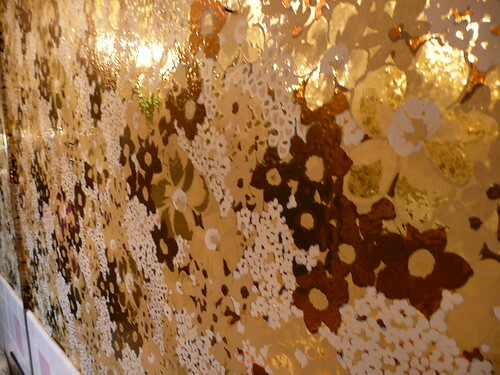 And the mirrored tiles were the kind with the gold flecks. 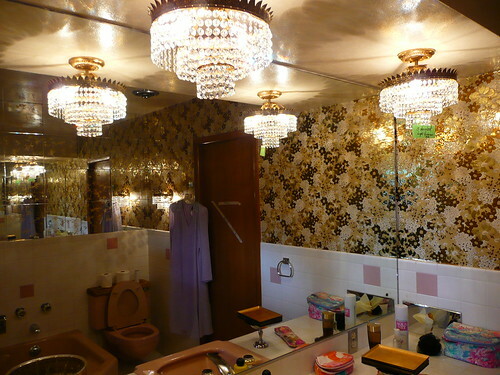 The whole bathroom was reminiscent of the ladies’ apartments in the complex we lived in when I was a kid in the late 70s. Those ladies are the reason to this day that I love gold shoes. Those suckers would convert nicely to any number of fine chandeliers. Give me that cart. Just…Ok, if I give you like fifty dollars every weekend, will you please buy things for us? Kiala – I’m coming over to your apartment now to leave the cart at your door and ring the doorbell and run away. What happens from there is out of my hands. Very cool stuff! I love it! Thanks for sharing your great finds.